It was with great anticipation that I opened the box that had arrived from The Vic Firth Company. As a matter of full disclosure, I am an official endorser of their products, but I promise to tell it to you straight anyway. That’s what this column “GearHead” is all about—telling you the truth about products we try. The idea behind non-wood sticks has always been to find a way to make sticks last longer. I was excited because the idea of having a stick that would stand up to a pounding better than wood was enticing. After all, what drummer wouldn’t want an indestructible stick? 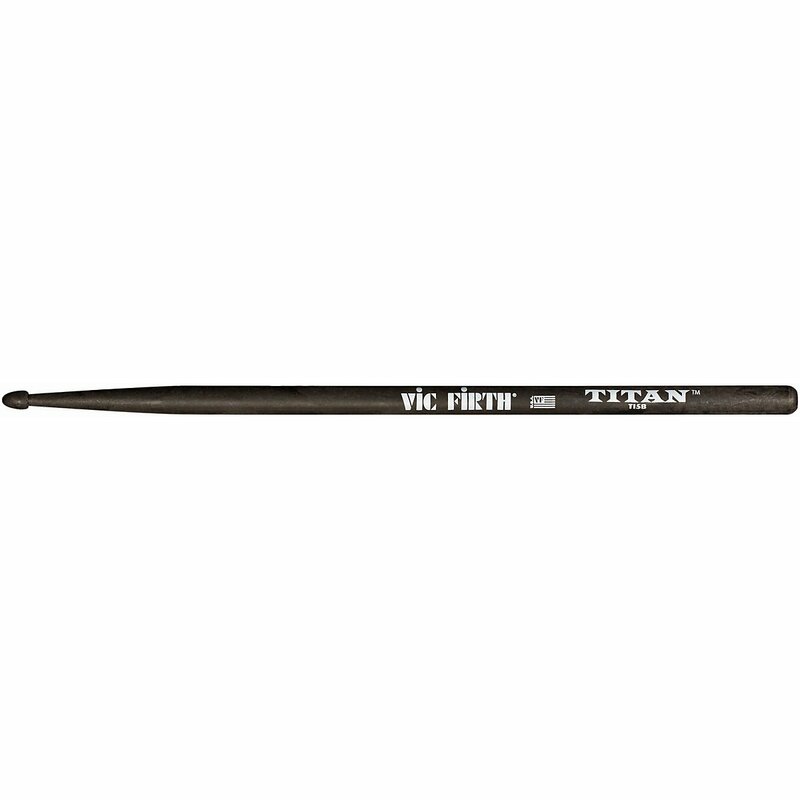 Well, truth be told, The Vic Firth Company does not claim that the Titan is indestructible. In fact, when I was asking the good folks over there about these sticks, they made certain to tell me that they were not indestructible. The claim is that they are just much more durable than ordinary wood sticks. That alone, if the sticks sound and feel good, would make these worth the price of admission. The durability is real. I’ve been using the Titans in my rock band, MANCIE, where heavy hitting is required. After the first two hours of this kind of playing, the sticks are hardly scratched and I’m confident that they’re going to last a long time. My test is going to be to see just how long this one pair of Titans lasts under the hard hitting of my rock playing. The other benefits are pitch pairing and weight pairing perfection. Because of the carbon fiber composite that Titans are made of, the manufacturing is completely controlled. Every stick is exactly the same. 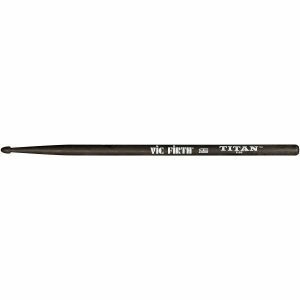 Every single Titan stick that Vic Firth makes weighs exactly the same and has the exact same pitch. That is kind of revelatory in and of itself. Imagine a stick bag full of Titans–you could just reach in a pull out any two random Titans and they will feel the same and sound the same. You could not do that with wood. Pretty impressive. What about feel? These sticks don’t feel artificial. They feel like “real” sticks. Titans feel good in your hands, the balance feels right and they respond and bounce the way you would expect regular sticks to respond. Check! And the sound? The drum sounds I could pull out of my kits with the Titans were just as good what I could create with wood. I couldn’t get one of my prized jazz ride cymbals to sound great, but these are not jazz sticks, so I don’t think that is a fair expectation on my part. I give these a thumbs up for rock playing. I’ll write again in a few months to let you know how these sticks are holding up. In the meantime, check out this video to see what Jojo Mayer, Dave Elitch, Cliff Almond and others say about Titan drum sticks.